Not the thunder and rain...actually, that too. But more than that, everyone misses watching their favorite team play basketball. Everyone misses getting ready before a game as if you're going to play yourself, then facing other anti-sports people who don't understand your love for this game. After that comes arguing with friends over questionable fouls, roaring and cheering for the team you love and sometimes, just sometimes, getting mad when the team is loosing but then regret it and declare your eternal love for them once they score a few three-pointers that lead to victory. 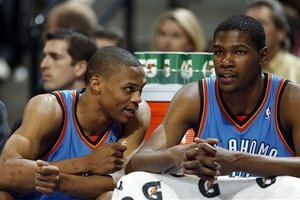 But most of all, us, the OKC Thunder fans, miss watching our favorite players as they create magic in the court. We miss getting ready before a game, as if we're going to play ourselves then facing other anti-sports people who don't understand our love for this game. After that comes arguing with friends over questionable fouls, roaring and cheering for OKC, and sometimes, just sometimes, getting mad when the Thunder is loosing but then quickly regret it and declare our eternal love for them, once Durant scores a few three-pointers, Westbrook a few dunks and Ibaka blocks the other team from grabbing the victory from OKC Thunder's hands. All overseas fans, we miss staying late, becoming night-owls just to watch and feel at the same time what everyone is feeling when OKC either wins or loses. Hopefully things will sort out soon, but in the meantime, you can occupy yourself with EuroBasket Lithuania 2011 where a lot of NBA players are present, fighting for their beloved country. Denver stumbled over Thunder on their way to adding one more victory to their six winning streak. But for OKC, only 12 minutes were required in order to let the Nuggets know who will win the game. During those minutes, Thunder took the lead by 27-16. "That was big, especially after losing two in a row. We were more putting an emphasis on losing two in a row, trying to end that, than trying to clinch the division." - said humble Durant. KD led the team with 32 points and nine rebounds. Westbrook contributed with 18, while Harden as usual, coming off the bench, added 13. Ibaka and Perkins did a good job at grabbing rebounds - 14 and 11, respectively. The forth quarter gave the Nuggets some hope when they scored five points which helped them take the lead, 72-69. Oklahoma City answered back with a 16-0 run, emphasized by Durant's slam on a pass from Maynor. Throughout 1:45 minutes that were left, Denver tried tempestuously, but failed to catch the Thunder. This game marked the first time OKC won against this team in seven straight games at the Pepsi Center. Only five games remain until the end of the regular season. Thunder now, meets up with L.A. Clippers on Wednesday night. On Wednesday night at the US Airways Center, Thunder played yet another phenomenal game. 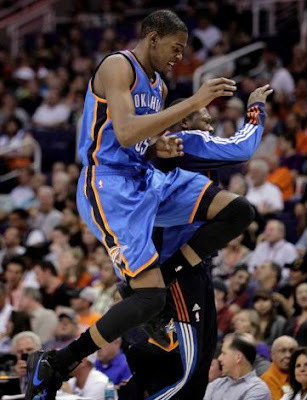 OKC added a third victory on their last two games - this time Phoenix Suns was their "victim" (116-98). Looking back at his last appearances, it's no surprise to know that Harden, coming off the bench, scored high 22 points. In his three previous games against the Suns, Durant had averaged 23.3 points. This time he scored 22 but only as a result of Grant Hill's noteworthy ability to guard him. Serge Ibaka had 15 while Westbrook contributed with 16 points and eight assists. A low number of points is not an indication of a job not done well enough - it's completely the opposite; Westbrook showed to everyone that he plays for the name in front on the jersey, not the one on the back. Coach Scott Brooks had nothing but words of praise for him. -"Russell was really good tonight. He's had better stats in the past but he really controlled the game. He was active on the ball and I thought his command of the game put us in a position to win tonight." With only eight games left in the season, Thunder meets with Portland Blazers on Friday night. Let's hope this game will be one of those games where the Thunder does what it does best - bring bad weather to other teams. All-Stars Durant and Westbrook, combined together stupendous 60 points which gave the Thunder a bounce-back win against Utah Jazz on Wednesday night (94-106). To this victory, except Westbrook's 31 and Durant's 29 points, the ones that contributed were also Serge Ibaka and Nazr Muhammed. 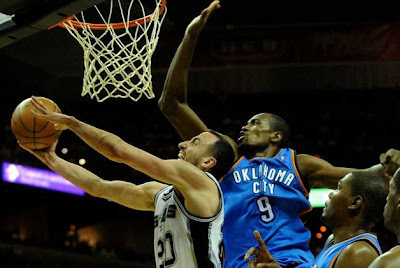 Ibaka's great performance was crowned with 15 points and 13 rebounds, while Muhammed scored 10, respectively four. Sefolosha's two steals and four assists, and Perkins' two blocks, increased Thunder's opportunity for the fifth time to hold opponents to less than 100 points. OKC's and Jazz's game during the third quarter was crucial at determining the winner of the game. Tied at 61 with only four minutes left, the Thunder took a nine point lead into the fourth quarter. As the end of the game was approaching, humble Durant hit two 3-pointers to boost the lead to 16 points. This high deficit made OKC comfortable enough to continue their path straight to victory. "It's good to get a nice bounce-back win. They're a very physical team. We knew they would play with desperation and I thought we matched their physical play" - said coach Scott Brooks. Brooks also said a few nice words about Mohammed's game - "Nazr did a good job of giving us a good spark when we needed it," he mentioned. "He is a very smart player and understands his role, what the team needs and when it needs it". Thunder next game is against Minnesota Timberwolves, Friday. OKC Thunder's château of six straight victories collapsed Sunday night by Toronto Raptors (95-93). Coming off the bench, James Harden led the Thunder with 23 points, followed by Westbrook's contribution with 22 and Durant's assistance with 20. Kendrick Perkins did a great job by grabbing 12 rebounds but failed at scoring two crucial free throws that would have given OKC the lead by five points during the last seconds of the game. "Our defense was great tonight but we just couldn't make any shots at the end. It is what it is. We just gotta work on it and move on" - said humble Durant. Toronto's forward Amir Johnson, decided the final result of the game when he scored with only 1.4 seconds left. However, Durant took the responsibility to change the final result. He shot at the buzzer but failed. Hopes fell and so did the Thunder. Next up for OKC is the game against Utah Jazz on Wednesday. OKC's magical duo, Durant and Westbrook, displayed their superhuman abilities by combining 47 points to Wednesday night's victory against Miami Heat (96-85). If you separate these two, they still remain strong individually. Humble Durant led OKC with 29 points, while Westbrook added 18. 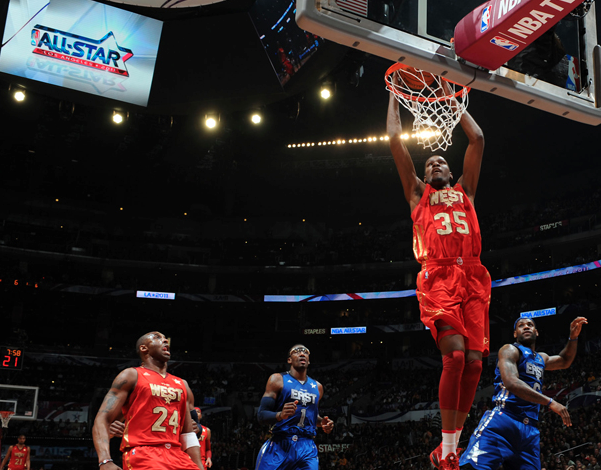 Double points weren't enough for Durant - he also grabbed seven rebounds and had six assists. Wade and Bosh scored 21 points for the Heat meanwhile James added 19. Together, they combined to shoot 21 of 69, one of their worst outings of the season. OKC's reserves scored 31 points altogether. The Thunder held Miami Heat to 38.5% shooting from the field, as Durant beat LeBron James for the first time in seven attempts. With a determined defense, especially in the third quarter, OKC took a 67-62 lead into the fourth quarter and never looked back again. "This was a good win against a team on the road. I told the guys before the game, it's a big game but there are 82 of them. We can't treat this game any different than we did Washington last game or Charlotte coming up Friday night" - said coach Scott Brooks. This game marks the fifth win in a row for Oklahoma City Thunder. Next up is the game against Charlotte Bobcats on Friday. "I wanted us to set the tone on defense from the start " - said coach Scott Brooks and that's exactly what the Thunder did on Wednesday night against Indiana Pacers. From the very beginning, the Pacers had trouble keeping up with OKC. On the first quarter, the latter kept a high margin of 10 points and continued increasing it throughout the whole game (113-89). Besides the strong D, Thunder's offence was well-rounded -- every active player scored. Russell Westbrook scored 21 points and nine assists while James Harden added 20. Humble Durant contributed only 21 points as a result of a sprained left ankle on the third quarter when he stepped in Tyler Hansbrough's foot and had to be taken to the locker room. Hansbrough led the Pacers with 13 points while Dahntay Jones scored 12. At the end of the third quarter OKC led by 27 due to a wonderful teamwork. This brilliant collaboration was also noticed at the free throw line where the Thunder scored an impeccable 19-for-19. The new Thunder players - Nazr Mohammed and Nate Robinson had their first debut with the team. They were saluted with a standing ovation by all Thunder's fans and bench. A victory such as last night's, keeps the Thunder three games ahead of Denver in the division competition. OKC Thunder's next game is on Friday against Atalanta Hawks. Victory slipped away from their hands. Or rather, the appropriate thing to say would be - the ball slipped from OKC Thunder's hands at the last seconds. Both humble Durant and James Harden had the chance to tie the game but both 3-pointers couldn't find the rim. 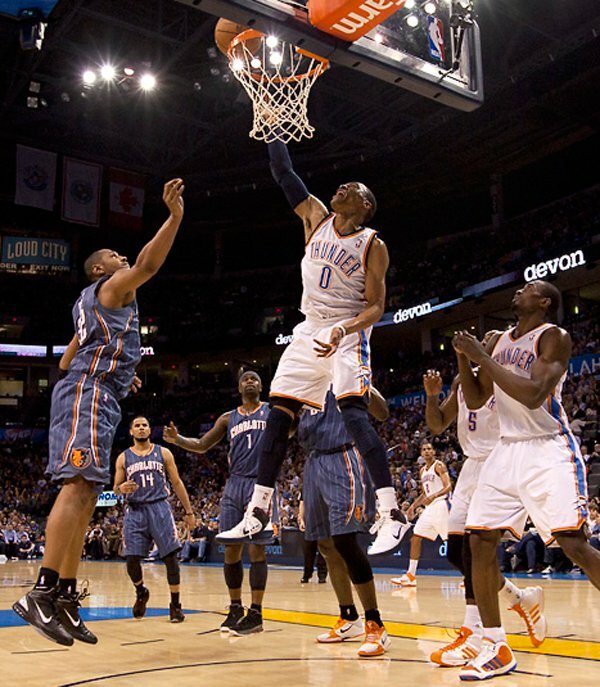 Russell Westbrook led the Thunder with 22 points, six rebounds and six assists while Durant had 21 points. They showed up but nevertheless, none of the new team members played. Pau Gasol was the one who led the Lakers straight to victory with 18 points and eleven rebounds. 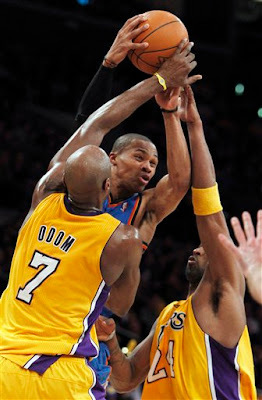 OKC made it especially hard for the Lakers during the first quarter when they kept the lead with as many as 14 points. Meanwhile, the halftime was particularly welcome for the latter since they came out much stronger defensively and blocked Westbrook from shooting at will. Even though Sefolosha and Harden did an outstanding job at blocking Bryant, he still managed to score (only)17 points and seven assists. The last 4.9 seconds of the game held everyone's breath when Durant's attempt to tie the score failed. However, hopes were revived again when Nick Collison tapped the offensive board back out top, at which point Harden had an open look with 2.8 seconds left, but also failed. "We wanted a three for KD at the end, it was a tough look but when we got the rebound James (Harden) had a good look. So yeah we wanted the three to tie and if that wasn't there try to get a two and get fouled." - said coach Scott Brooks. This game was the third loss in a row for OKC this season. Next up for the Thunder is the game against Indiana Pacers on Wednesday. The Oklahoma City Thunder is now officially a team with three new players. In order to obtain the services of Nate Robinson and Kendrick Perkins (Boston Celtics) exchanges were made. The ones that "suffered" were forward Jeff Green and center Nenad Krstic. “It is never easy to make decisions such as these and I thank Jeff and Nenad for their contributions to the Thunder organization and to this community. 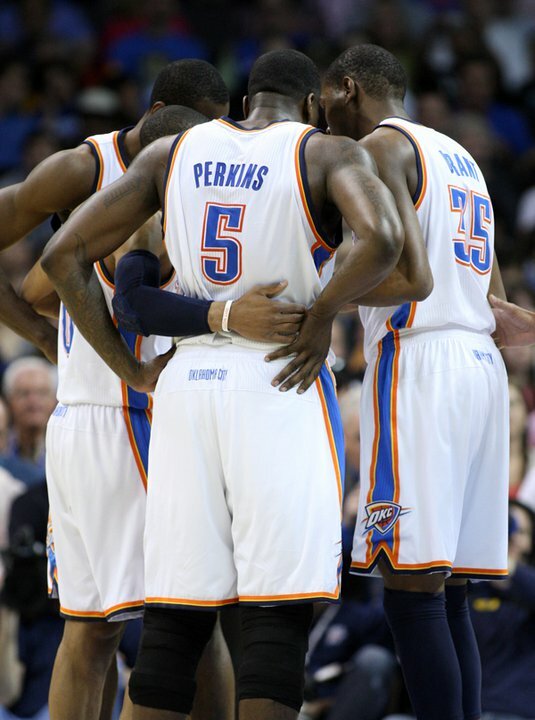 They define professionalism and I wish them the very best in the future,” Presti said. Perkins is expected to miss at least one week due to a sprained ligament in his left knee. His appearance at the NBA (8th season) is crowned with career averages of 6.4 points. He appeared in 12 games this season with Celtics, with an average of 7.3 points and 8.1 rebounds in 26.1 minutes. Robinson who won the Slam Dunk three times in a row (the only one in NBA history) is currently in his 6th NBA season. He possesses career averages of 11.3 points. He attended 55 games with the Celtics, averaging 7.3 points and 8.1 rebounds in 26.1 minutes. As much as he's excited with the new players, Presti also acknowledged the fact that it was very difficult to trade Green. In an individual deal, the Thunder traded shooting guard Morris Peterson and forward D.J. White to Charlotte in exchange for center Nazr Mohammed. “We would like to thank both D.J. and Morris for their many contributions here in Oklahoma City on and off the court,” said Presti. In 747 career regular-season games, Mohammed holds career averages of 6.9 points and 5.4 rebounds in 17.9 minutes per game. This season he is averaging, 7.3 points and 4.9 rebounds in 16.7 minutes per game. Wednesday night marked the sixth win for San Antonio Spurs over OKC Thunder (105-109). Six was also the number of available seconds Jeff Green had in order to tie the result. This attempt however, ended with an off-balance 3-pointer. The atmosphere at AT&T Center was similar to a playoff game. San Antonio was trying to win their 26th game at home while the Thunder was trying to win for the first time this season against the Spurs. Tension was building up when Gary Neal received a seemingly unintentional elbow from James Harden and especially when Parker got fouled from Collison on his way to the bucket. The ones that received technicals for this were humble Durant and Tim Duncan. OKC entered the fourth quarter with a result 88-80, but with a pair of 3-pointers made by Harden and Cook, the Thunder managed to lead by two points. During the final seven minutes, Harden had the chance to raise the margin by five points if he wouldn't miss a three. Tony Parker took advantage of this situation - he got the rebound, got fouled, hit both shots and tied the result. KD scored a high number of 30 points and nine rebounds in comparison to the two previous games against the Spurs (he averaged less than 20). Russell Westbrook contributed to the team with 25 points. 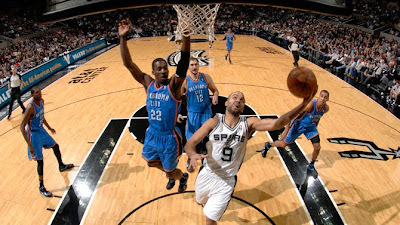 For San Antonio, the player that had the highest number of points was Tony Parker (20). In case you don't have any plans this Friday night, turn on the TV and watch Thunder's next game against Orlando Magic. LA Clippers forward Blake Griffin was welcomed with an enthusiastic ovation back to his hometown in Oklahoma City. However, the moment the game started he was treated as any other rival by OKC fans. Tuesday night, the Thunder won for the first time in Oklahoma City against the Clippers with a result 88-111. A pat on the back goes to Jeff Green for scoring 22 points, Durant 21 and Harden who came off the bench and contributed with 19 points. Besides them, the bench altogether scored as much as 44 points. "It was a good win, everybody chipped in and helped us win this game tonight." - said coach Scott Brooks. Thunder center, Cole Aldrich made his first appearance after several weeks. He played 11 minutes, scored two points, had four rebounds and blocked a shot. The credits for the Clippers' attempt to win, go to Blake Griffin who led his team with 28 points, 11 rebounds and eight assists. OKC now has won eight of their 11 games. Three of their last four games were won with a noticeable margin; 121-105 at Utah, 126-96 over Sacramento and last night's 111-88 win over the Clippers. Next up for the Thunder is the game against San Antonio Spurs on Thursday. Good afternoon, and in case I don't see ya, good evening, and good night! Actually, they're more than good - they're great, especially when you get to watch basketball for three days in a row as your favorite players from different teams play side by side. This weekend made no exception. Us, the ordinary people, had the chance to catch a glimpse of the oh-so-far-away stars, on and off the court. Before sitting in front of the TV with friends, family or snacks, and just a few minutes before seeing Durant, Bryant, James, and other stars, all eyes were on Josh Groban who sang the U.S National Anthem. Unsurprisingly, his magical singing was flawless and fluid. During the national anthem, instead of putting their hand close to the heart, most of the women (taken away by his voice) kept them under the chin while each one of them hummed the song "Killing me softly" as Josh kept singing. After that moment, everyone's attention was directed to the game. The competition was amazing between the two teams. This was noticed especially during the fourth quarter where the West had difficulties but managed to win the game with a result 148-143. With James, Bosh and Wade you could say the team of the East was the beast, but the team of the West was the best. To the tremendous 148 points, Durant and Westbrook together combined for 46 points. KD contributed by scoring amazing, 34 points and a perfect eight for eight from the line. He also had a pair of steals and blocks. Westbrook's 14 minutes were crowned with 12 points, five rebounds and two assists. “It was a great feeling. It was fun to be back at home in front of my family. I had a good time.” - said Russ on his first AS game. Back to Durant, his 34 points line him up as the 14th player in AS game history to score 30 or more. This number of points ties him with Tracy McGrady, Tom Chambers, Julius Erving and George Gervin for seventh best scoring performance in NBA history. The MVP went to Kobe Bryant who scored as much as 37 points, but KD was second best. On the post-game news conference Bryant mentioned that when it comes to getting the spotlight, it’s time for him to step aside and make room for the young guys. Besides being proud of playing aside Bryant, humble Durant was especially proud of Westbrook. Other Thunder players who participated at the AS game were Serge Ibaka at the Dunk Contest (had a great appearance but didn't make the finals) and James Harden at the Rookie Challenge who scored 30 points. 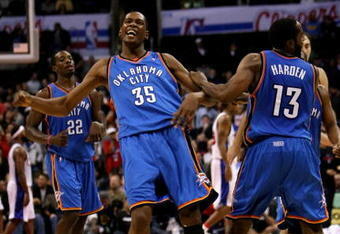 Now that the weekend's over, OKC's players are back in Oklahoma. Tonight the Thunder is playing against LA Clippers. Our guys may be a little tired but don't forget what Tommy Lasorda said about doing something you love: Guys ask me, don't I get burned out? How can you get burned out doing something you love? I ask you, have you ever got tired of kissing a pretty girl? No matter the circumstances, I know it and you know it - they love this game. Daequan Cook scored 20 points as he helped the Thunder prepare delicious, 126 points against Sacramento Kings Tuesday night. 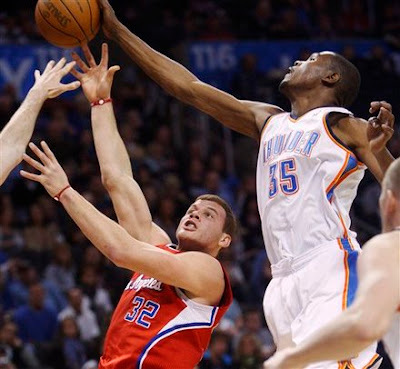 He also contributed with five rebounds while Durant had only 17 points and collected seven boards for the Thunder. OKC had seven players with double figures - Jeff Green and Nenad Krstic both scored 16 points, Serge Ibaka had 15 points, nine rebounds and four blocks. James Harden contributed with 12 points and Russell Westbrook had a double-double of 10 points and 11 assists. Thunder's entire starting lineup watched the game from the bench in the fourth quarter as the rest of the team took the lead by 25 points. "We did a really good job of coming out and playing good defense. We played about as good as we can play. 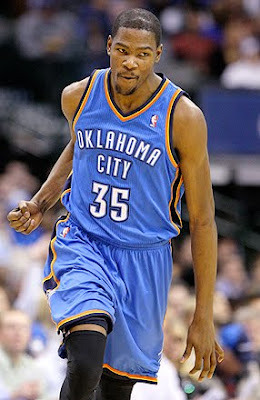 Kevin (Durant) talked to the guys at shoot-around this morning about the importance of coming out strong and we did." - said coach Scott Brooks. Besides scoring a team-high nine boards, Ibaka jumped everybody out of their seats by rejecting a dunk attempt by Jason Thompson in the final two minutes. OKC now goes into the All-Star break with seven games won of the last ten. Next up for the Thunder is the game against LA Clippers on Tuesday, but before that, we have three OKC Thunder representatives (Durant, Westbrook and Ibaka) at the All-Star weekend. Don't forget to watch them as they will return to Oklahoma with nothing but the best - victories. "We just made too many mistakes to win tonight." - said Nick Collison whose words describe Oklahoma City Thunder's game against Golden State Warriors. OKC failed to win last night as they fell to the Warriors with a result 94-100. Kevin Durant scored 29 points but committed three turnovers. Stephen Curry, except doing a sensational work of scoring 23 points and 13 assists, he also did a good job at throwing Russell Westbrook off his usual game. Nick Collison had a season-high of 10 rebounds for the Thunder. James Harden scored eight straight points as OKC held a 28-25 advantage. The lead changed six times as both teams kept fighting for this victory. Later on, the Thunder didn't give up as Jeff Green scored a three-pointer to make it a one-point game at 93-92. OKC's focus at stopping Curry and Ellis proved to be a bad call since Reggie Williams took advantage of the gap and scored a three-pointer with only 47.2 seconds left. After humble Durant made two free throws, David Lee finished the game with a nice dunk. Next for the Thunder is Sacramento Kings on Tuesday. Oklahoma City Thunder bounced back after losing to Memphis Grizzlies on Wednesday night. 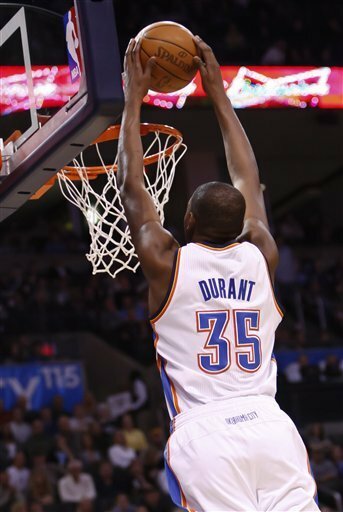 Saturday marked an important victory of OKC against Sacramento Kings (99-97) - the fourth in five games. The Thunder took the lead thanks to Eric Maynor's 3-pointer which also ended the first quarter. This advantage continued almost throughout the whole game - OKC almost gave up during the final moments. Our team was leading by only two points with 5.8 seconds remaining when Durant missed both free throws which gave the Kings one more opportunity. All Thunder fans wiped their forehead - including Durant and the rest of the team when Tyreke Evans missed the three-pointer. Even though he missed those free throws, humble Durant finished the game with as much as 35 points. James Harden had a career-high five steals. 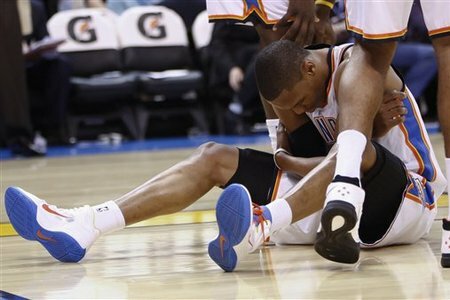 Kevin Durant twisted his left ankle during the third quarter but kept playing. "Yeah, it should be alright. Twisted it a little bit tonight in the third quarter. But you know, I kept pressing and putting my weight on it. If it was hurt too much I would have come out of the game but it was cool for me to finish the game and hopefully it will be cool tomorrow." - said Durant. Next up for the Thunder is the game against Golden State Warriors. For the second time this season, the Thunder showed to Utah Jazz what is it like to play for the name in front of the jersey not the one on the back. OKC won over Utah with a result 121-105 Saturday night as the crowd at EnergySolutions Arena watched magic happen silently. Russell Westbrook proved to everybody he's one of Oklahoma City Thunder's main pillars as he scored 33 points, 10 assists and a marvelous, career-high four 3-pointers. Humble Durant scored 21 points and 12 rebounds, Jeff Green had 20, while former Jazzman Eric Maynor came off the bench and scored 10 points in the first half. The Thunder had a few problems at the beginning of the game with Utah scoring their first 11 shots. But shortly after that, our guys bounced back at their usual majesty which they make it look so simple. OKC took the lead of the game on the second quarter when Green switched over a three-point play by changing it 57-56. Green didn't stop at this - he continued scoring another three-point play to help the Thunder leave behind Utah with a result 62-57 at halftime. This game marked the fifth victory of their last six games which contributed at Thunder leading the Northwest Division. Next for the Thunder is Memphis, Tuesday. Until then, don't forget - THUNDERUP!!! It was one of those games. You know, the ones where even the snow storm can't stop Durant from scoring 43 points; 10 rebounds were also added by him to mark an important victory over the New Orleans Hornets (104-93). Jeff Green and Russell Westbrook also contributed by scoring 12, respectively 10 points and eight assists. Serge Ibaka also did a great job by scoring eight points, 12 rebounds and six blocks. "I think his first three possessions he gave us three rebounds and that's what we want from him every night. I thought he was really good. He was active tonight, and that's what we need from him. "- Brooks said. This was Thabo Sefolosha's third straight missed game because of his sprained left knee. His status remains day-to-day. OKC's defense was at their best during the third quarter, limiting the Hornets to only 17 points on 4-for-20 shooting. 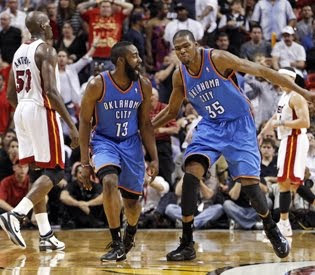 With time running out, Durant grabbed a rebound and nailed a step-back jumper at the buzzer. David West led the Hornets with 20 points and 15 rebounds. Chris Paul added his share with 15 points and five assists. Hornets' forward Trevor Ariza left left the game during the third quarter due to a sprained ankle. Although they tried their best, the only worth-mentioning highlight from New Orleans Hornets was when their bus got stuck and they had to switch to another one. While doing so, Chris Paul and Trevor Ariza decided to throw snowballs at coach Monty Williams, who playfully said he has yet to determine their fines. 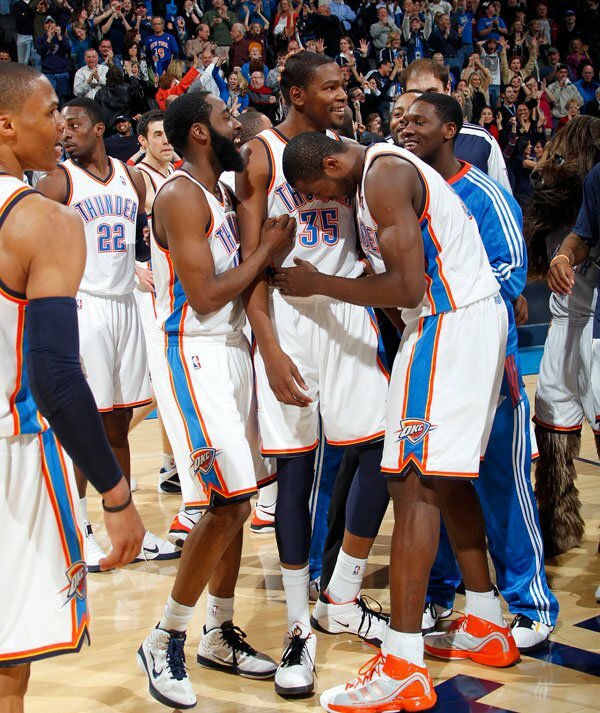 OKC Thunder won over Minnesota Timberwolves in OT with a tight result 118-117. This happened all thanks to Durant's amazing appearance who managed to score as many as 47 points and a career-high 18 rebounds. By doing this, humble Durant helped the Thunder get back on their feet from a three-game road losing streak. Jeff Green and Russell Westbrook also landed a hand at last night's victory. Green scored 19 points while Westbrook added 16. Durant showed his scoring abilities especially during the final minutes of the game. He kept scoring big shots which helped at stopping the Timberwovles. During the overtime, the two teams applied the saying "it's all or nothing". There was hardly ever a two-point lead that stayed like that for long. But the turning point was definitely a missed free throw by Corey Brewer with 7.6 remaining in OT. The Thunder took advantage of that and closed the game with a one point win. To close it up, here's something that humble Durant said that's worth putting on the best basketball quotes - "...a fun game to be a part of. A game as a fan you hate to see end. As a player you want to play these type of games". If it's sharp, shiny or electric, avoid it at all costs. "Score at will" is the best way to put into words Russell Westbrook's game against the Lakers. His amazing 32 points, 12 assists and two steals weren't enough though to win Monday night's game (94-101). Even though the Thunder didn't leave from Los Angeles with a victory,at least they earned LA Lakers' respect. "We don't look at them as kids any more," Odom said. "This team pushed us last year. We have to play them hard, or else they can stick it to you when it counts. They're still one of the best teams in the league. We respect them." Our humble Durant scored 24 points but he was 8-for-24 shooting while Serge Ibaka added 11 points and 10 rebounds who marks only the third OKC player with double digits. The Lakers led by 15 points but the Thunder cut it down in the third quarter to 78-75. Later, with only 2:04 minutes left, OKC approached to Los Angeles within 98-94. But Westbrook missed two free throws of his own with 21.4 seconds left before airballing a 3–point attempt. If he'd manage to score those, we'd be celebrating and partying. In other words - as Ricky Gervais recently said: It's going to be a night of partying and heavy drinking. Or as Charlie Sheen calls it: breakfast. A last-second battle is what defines last night's game against Orlando Magic. The result was very close (125-124) but even with a 3-pointer at the buzzer, Magic found the Thunder unstoppable. Unstoppable is the perfect definition of Kevin Durant and Russell Westbrook's appearance - together they combined 68 points which gave the Thunder the fourth straight win. Durant led OKC with 36 points (his third straight game with more than 30 points) while Westbrook added his second triple-double of the season with 32 points, 13 assists and 10 rebounds. OKC started the fourth quarter very well by taking the largest lead of the game at 98-86 which was the main indicator of the last night's winner. Orlando's center, Dwight Howard scored high numbers - yes, higher than KD. He added 39 points and 18 rebounds as his team went home with a loss. OKC's next game is against LA Lakers. We need our team to get ready, relax, have a massage, sleep and eat well. Even though the Lakers are favored to win this game, the Thunder has the opportunity to show people that being an underdog has it's own advantages, while the Lakers have the disadvantages of the overdog. Never say to Kevin Durant and Russell Westbrook the words don't and stop - unless these two words are used in a sentence. 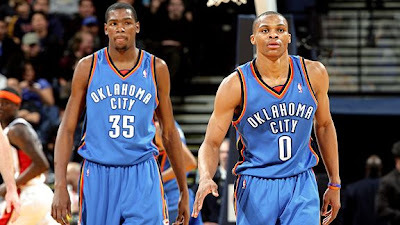 NBA's highest scoring duo put their magic to work by combining 62 points as the Thunder won over Grizzlies 109-100. Together they missed only one of their 24 free throws. OKC led the game 99-97 with only 2:09 minutes left. After that, the Thunder scored a chain of nine consecutive points and took the high road. 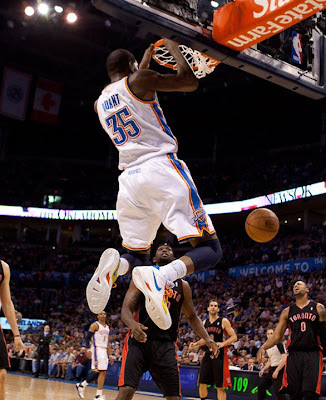 This game's limelight was humble Durant who scored 40 points, grabbed eight rebounds and four assists. Westbrook scored a double-double with 22 points and eleven assists. The Thunder as a team had 47 total rebounds and 18 turnovers while scoring 38 points in the paint. "We beat a really good team tonight. They're a match-up problem for everyone in the league." Durant and Westbrook are turning into the best and toughest match-up for any team. OKC's next game is against Houston. Let's hope that our magical duo has still some magic tricks left on their sleeves to win games like this one. Tomorrow is officially the day when I become a year more mature. Tomorrow is my birthday people! Not that it has much to do with Oklahoma City Thunder or anything...actually it has nothing to do with our team. Well, enough about me. Let's talk OKC now. I hate to say it but - I told you so! Third time IS a charm. OKC got back on their feet after suffering two losses. The third game wasn't going to be the same though. Our team won over Dallas Mavericks with a result 99-95. The first half didn't contain that much of a solid game. The second one though, was a strong indicator that the Thunder was doing a great job with a much stronger defense. The Thunder as a team, had nine thefts only at the first half. Seven OKC players were given credits for at least one steal, all attached to Durant and Harden's three steals. Shawn Marion took care to almost keep up with OKC since the Mavs were short-handed. Of course, that wasn't enough to break the Thunder's defense. Our team did a helluva good job with Kevin Durant leading the way - he scored 28 points, two rebounds and three assists while Russell Westbrook had 15 points and nine assists. Jeff Green had 16 points and nine rebounds, and Serge Ibaka added 13 points and eight rebounds. OKC's next game is against Memphis Grizzlies. Let's hope that this time instead of Third, we'll say second time's a charm. A piano or a simple Happy Birthday from humble Durant is a dream come true. But what really counts for me and you my friends, I think, is simply the fact that you can turn to someone and say: You didn't forget! January is a great month - and I'm not saying this just because Muhammad Ali, Jim Carrey, Elvis Presley, Denzel Washington and, ahem - me, were born during this month. A lot of nice things occur on January but judging their last games played this month, the Thunder ain't thinkin' the same. OKC fell to Memphis Grizzlies 110-105. Memphis carved their victory as early as in the first quarter. The second quarter was all Thunder. Our guys managed to lead the game most of the time and also went to halftime tied at 55. The third one, needless to say had it written Memphis Grizzlies all over with Rudy Gay leading the way. 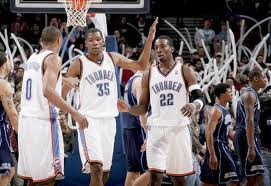 The Thunder as a team, collected only three offensive rebounds, while in general OKC was outnumbered by Memphis 42-31. Russell Westbrook was the one who had impressive numbers - he scored 28 points, seven assists and four rebounds. Kevin Durant also had the same scoring numbers - 28, made nine rebounds, three assists and two steals. OKC's next game is against Dallas Mavericks. Our team lost both meetings against them but hey, you know what they say: Third time's a charm! We could really use a little luck. The Thunder has been on a roller-coaster lately and definitely didn't enjoy the ride. OKC's 2010 had a great closure by beating Hawks 103-94, winning previous games against Nets 114-93, then falling to Mavericks 103-93 and last but not least - San Antonio Spurs debacle 101-74. Let's stop at the latter, shall we? This game marked a season-low of 33 percent shooting which lead to a much deserved win of Spurs with a result 101-74. Our humble Durant also had a season low - scored only 16 points. The first quarter was the strongest indicator that the Thunder was in a fragile shape. Our guys missed 10 of 12 scoring opportunities and fell behind by 14 points. OKC though, won over Spurs when it comes to offensive rebounds (Thunder 14, Spurs 11) and turnovers (Thunder 19, Spurs 14). To the list of season-lows we can add Russell Westbrook's appearance who scored only eight points and the 10 assists in total of the team. Just like any other game, a player stands out from the rest. Although in the midst of a debacle, Serge Ibaka managed to score for the Thunder 14 points, 13 rebounds and four blocks. This loss is very hard to swallow but we have other games to look forward to, such as Tuesday's game against Memphis Grizzlies. Plus it's only the beginning of the year which means that Thunder fans have one more number to add at their New Year's Resolutions list - to be more supportive of their favorite team. Either way, I always say: Keep your hair and your New Year's Resolutions list short - they're more manageable that way.